Last week I show you the finished pieced top of my second Candle Mat. I was very happy with it so I continued the project and finished it, including writing on the back of it a little Christmas greeting to my swap partner. 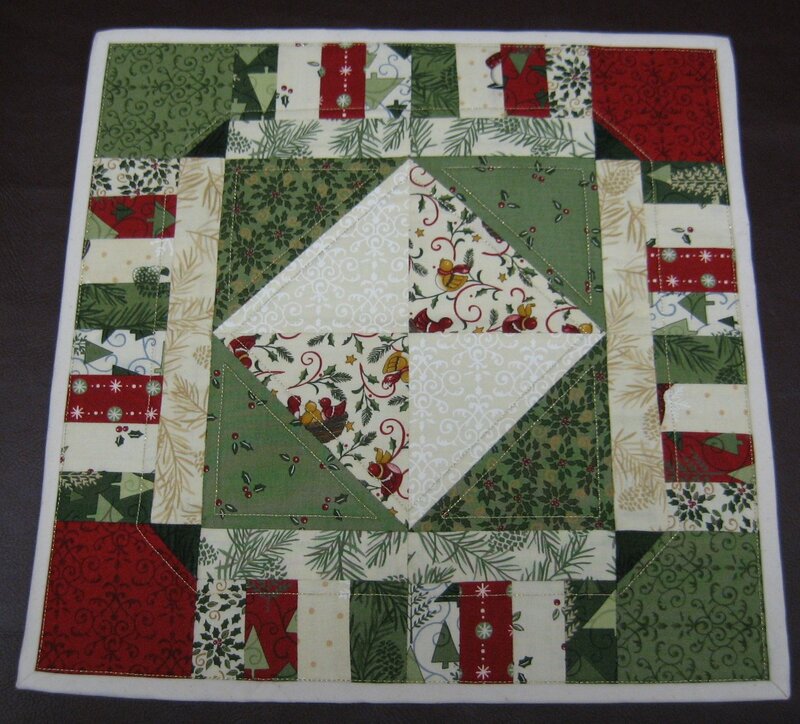 So it is official...this one will definitely be my swap gift for the Candle Mat Swap! And here it is, all quilted and bound. 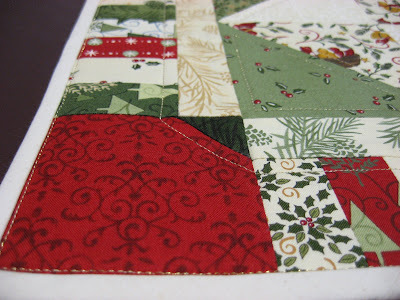 I used metallic gold thread for the machine quilting which gives it just a little bit of holiday sparkle! I made the binding from the same ecology cloth muslin that I used for the backing, but I did not just turn it over from the back. I actually made 2 1/2 inch bias binding and machine stitched it onto the front, then turned it over and machine stitched it again from the front using gold thread so the gold stitching line would show just next to the binding. That's my way of machine stitching binding on without having to hide the stitching in the ditch, which I am not at all good at doing! Yesterday was an election day here in my state so I worked as usual, except this time I actually worked! I brought my crocheting with me, all ready to spend the day socializing with all my neighbors and cranking out the rest of clue #5 for the Bernat Mystery Afghan Crochet-Along, but did not have even a moment to open my bag! That was a good thing though because it meant that we had a good turnout for the election! Next up, I will show you what blocks I have completed for the crochet-along. Clue #5 is a bit similar to the mitered squares baby blanket I made some time ago which you can see HERE, but it is multi-colored. I have not yet started on clue #6, and clue #7 was just posted this morning, so I am way behind on this project! Not to worry though. I will finish up the details of the Christmas swaps I am doing, then get right to work on some serious crocheting! Ho ho ho! It appears that someone is getting ready for the holidays! It's beautiful. I liked the golden thread, it was very nice for Christmas! It will be exciting when we are going to send the candle mats away. I still have to make a label on the back. Oh it turned out so beautiful! It will be loved! Absolutely beautiful Mary Grace!! I know your partner will be thrilled. Oh I see! Thank you for sharing. 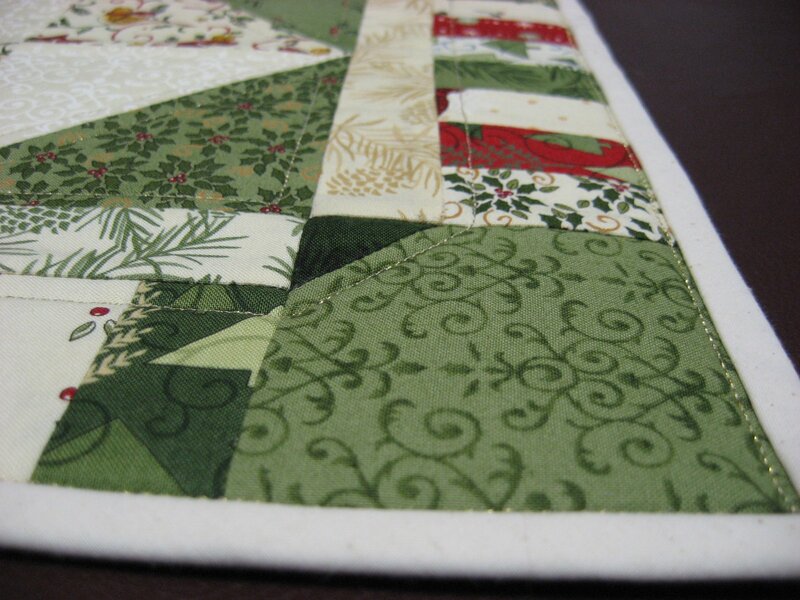 That is pretty neat and gives the quilt some extra spiffiness! That is a very pretty way to attach the binding. It looks very professional. 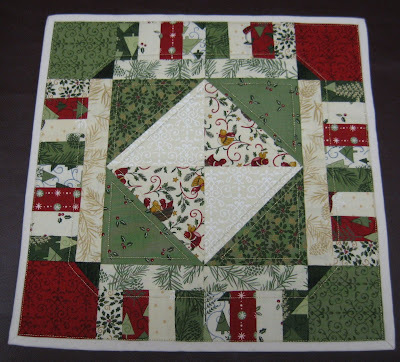 Quilted Candle Mat - Take 2!